Playing chess with PoS hardware! The player enters the coordinates in the payment terminal, then the LCD will display them. If the player agrees, he presses OK and the updated board will be printed by the opponent printer. 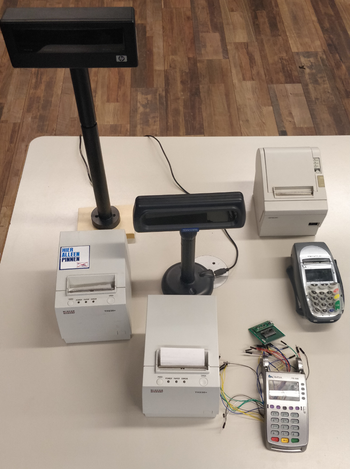 The payment terminals use an Arduino Nano with an MCP32017 I/O extender connected over the I²C bus, who send the keys pressed over a serial connection to a Raspberry Pi. The RPi uses a Python script that receives the serial bytes, processes them and prints it over serial to the USB PoS display. Using python-escpos and python-chess it should print the updated chess board. This is still WIP as the printer doesn't seem to print wide images.